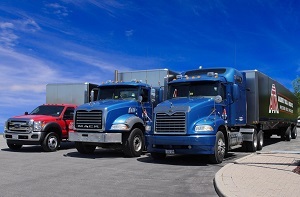 Our fleet of trucks, with a maximum load capacity of 52,000 lbs., operates 24 hours a day, 7 days a week throughout Canada, the United States, and Mexico. We can promptly handle all customs documents required to expedite your shipment throughout North America. Our global commitment with working partnerships has increased our capacity to be highly competitive. Aalbers has earned the distinction of being a leader in on-time delivery to customers. Let Aalbers Tool and Mold Inc. show you how easily your logistic needs can be facilitated.